Hit the trail hands-free with your running buddy while adhering to leash laws with this clever dog leash! 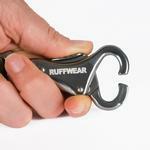 The Roamer Dog Leash by RuffWear in Obsidian Black is perfect for the active dog owner. This dog leash has an elastic core that extends, allowing you to maintain control while your partner enjoys a generous range of movement. 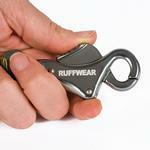 The side release buckle allows for three handle conversions: hand-held, waist-worn, or fixed leash. Made with sturdy 1-inch tubular nylon webbing, this dog leash will pass the test of even the strongest-pulling dog. Medium: Resting Length - 5.5', Extended Length - 7', Width - .75", Maximum Waist-Worn Handle Size - 40"
Large: Resting Length - 7.3', Extended Length - 11', Width - 1", Maximum Waist-Worn Handle Size - 40"
Great Long Leash. Heavy Nylon. Waist fit for Free-Arm Running. 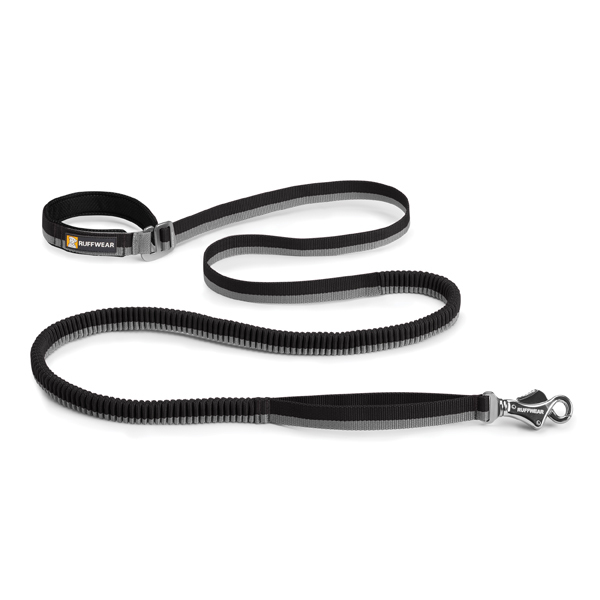 Great long leash with waist or hand adjustment., making it great for running with your dog. I have three of these leashes in various colors. Unfortunately, over time they stretch out and the bungie relaxes, but overall I prefer this heavy nylon over most of RuffWear's nylon flat leashes. This leash is available in Ruffwear's great bold colors! Deffinately five star if they fixed the bungie issue.